For anyone who might just be picking up on this for the first time; for the last three years I have been preparing six pictures to exhibit at the next RHS Botanical art exhibition. It is to be held in London at the RHS’s Lindley Hall, 11-12 April. The pictures are of six different crabapples, Malus ‘Red Jade’, Malus ‘Evereste’, Malus x robusta ‘Red Sentinel’, Malus x atrosanguinea ‘Gorgeous’, Malus x zumi ‘Golden Hornet’. 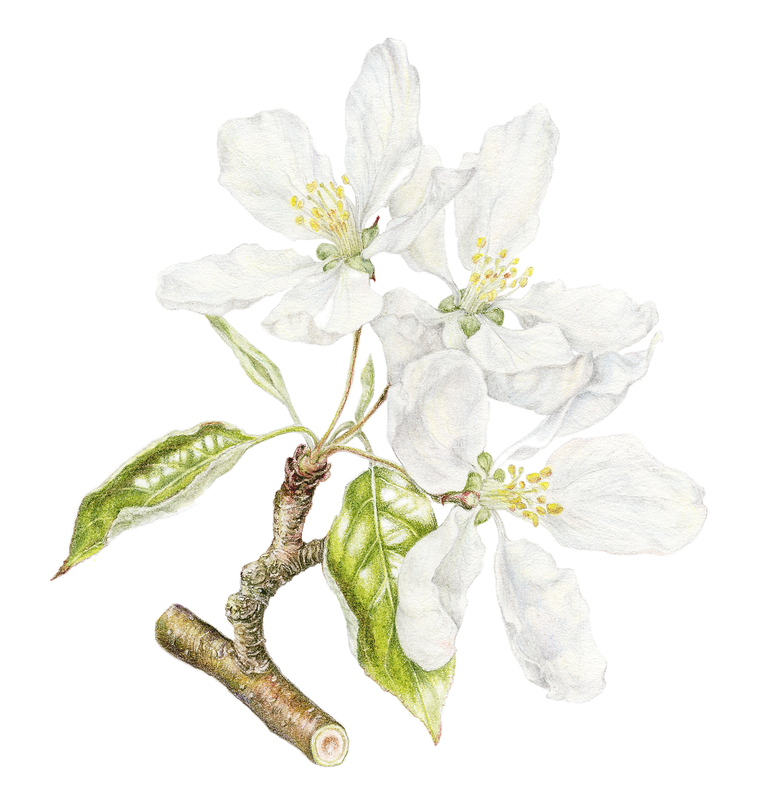 Each of them are in coloured pencil and are of ripe crabapples, dissected crabapples, crabapple blossom, Longitudinal section of the flower, enlarged stamen, style & stigma and a transverse section of the ovary. Each picture basically shows in detail the times when people are most interested in the life of a crabapple tree. Normally one sees the tree covered with blossom later on in April to early May and the next time one is interested is when the tree is covered with red or yellow apples. But do people really look at the trees, the blossom or the apples? Very rarely. For example, they assume that the blossom is the same on each tree. But they are very different. I wanted to show the beauty of the trees right down to the detail. But I also wanted to create beautiful pictures of the whole works. Obviously it is up to those who view the pictures as to whether I have succeeded or not. It will also be up to the judges at the RHS as to whether I get a medal or not. The judging is carried out by the picture committee and these include botanical artists, botanists, and photographers. They have extremely strict criteria and I will be judged on my worst picture. This means that they are not only judging for correctness of botanical detail, but also how I use the medium I have chosen, the composition, the information I have provided in and with the picture, and the way I have presented the exhibit. They want to see that my work is consistent and that is why the worst picture is judged: Bearing in mind, no picture is ever 100% perfect! Today I have had to re-do one of the pictures for colour matching in Photoshop. I discovered this morning (after I had spent all morning teaching), that one of the pictures was incorrectly colour matched. Why do I need this? I will be using segments of the pictures (as I have shown you in the blog) to provide further information about each each picture at the exhibition. Additionally, I will be able to get gicleé prints from these – although that is of lesser importance at the moment. It is now dark, so I will have to wait until tomorrow to see if I have succeeded with this or not. In the meantime, I am getting as much information as possible about the crabapples I have chosen. And now, a glimpse of the next picture, the M. John Downey. Now these are very different to the M. Red Jade, M. Evereste and M. Red Sentinel that you have seen in earlier blogs – aren’t they? Thank you Jane. Your photos were lovely too. Thank you Anne. I think I know which paining is likely to be judged as ‘worst’, but we will see.